French pastries always fascinated me, its complex yet look simple, and always have an air of sophistication. 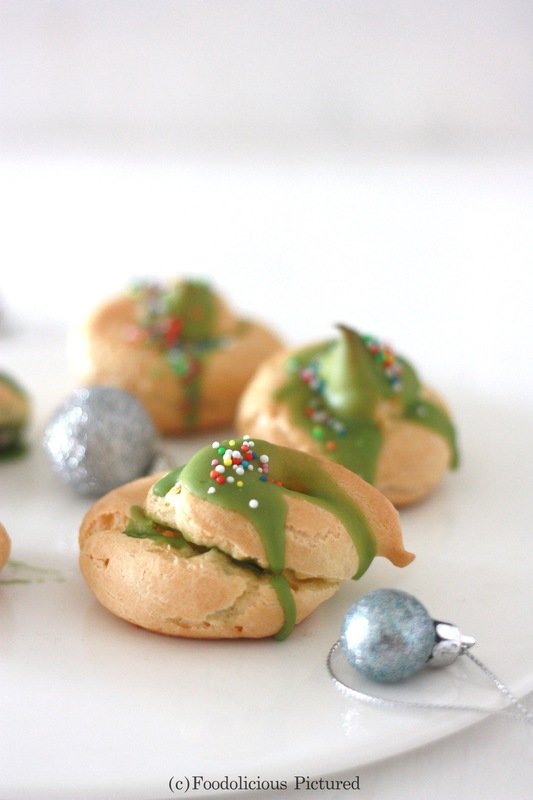 Taking about something airy, I finally got to try my hand on Choux pastry – its airy, light and crisp, and I really was so elated when I got it right. 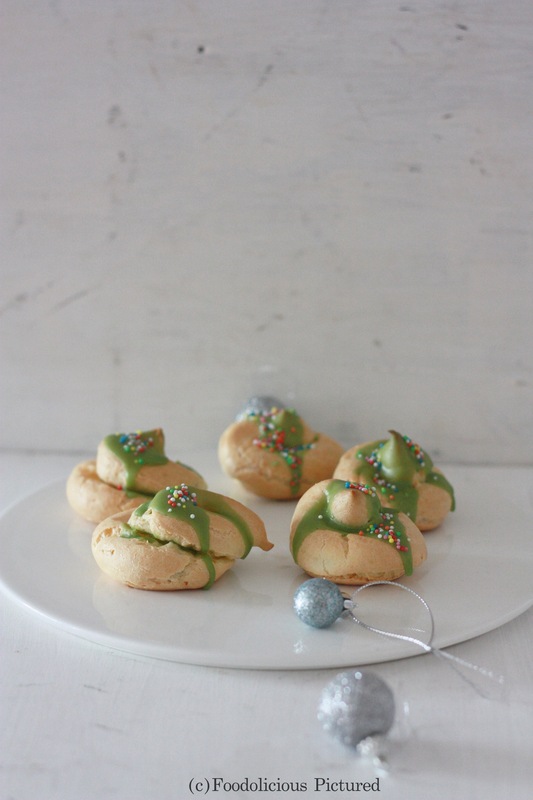 To go with the Christmas theme, I let the peaks stay on, and filled/decorated those with some green icing and some colorful sprinkles – perfect color for the festive season! Pre-heat the oven to 200 C. Sift the flour and set aside. 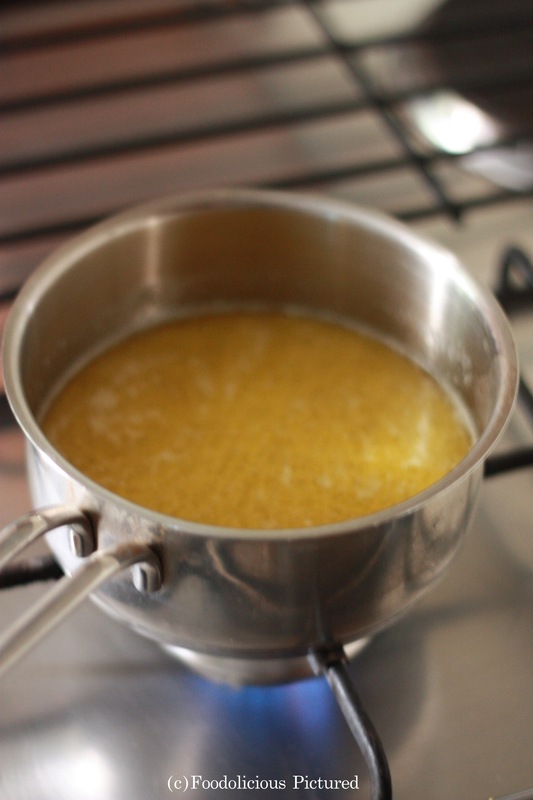 In a sauce pan add the water and butter and cook over medium heat until the butter is melted and water starts to a boil, turn the heat off and remove the pan from stove. Add the flour all at once and mix till there are no lumps. Now turn the heat on to medium-low and cook the dough stirring continuously until it starts to leave the sides of the pan. Turn the heat off and move the dough into a bowl of a stand mixer and turn the beater on to low speed. Add the eggs one a time and making sure to mix well after each addition. 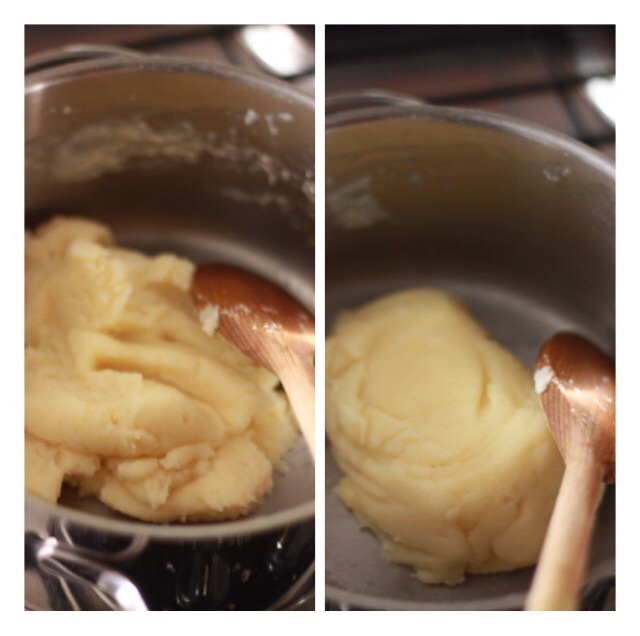 Beat till the dough is shinny and smooth enough to drop off from the spoon. Spoon the dough into a piping back fitted with a round tip and pipe the puffs on to a baking tray lined with a baking sheet or mat. Bake the puffs for 15 mins and then reduce the temperature to 180 C and bake for another 10-15 mins. Cut the puffs carefully and fill in the whipped cream/icing in the middle and place the other half back. To Decorate – Mix the icing sugar, water and food color to smooth paste. Spoon the prepared icing sugar on top of the puffs and some colorful sprinkles. Serve warm. Puffs looks so good! yummy! So Christmassy and perfect. I had to visit after seeing them on Insta. They look amazing Rekha. 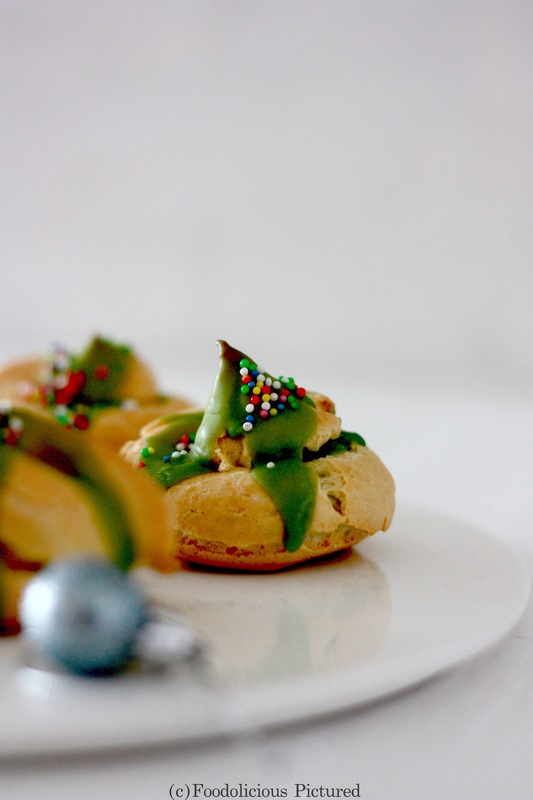 Choux pastry is such a magical one. Merry Christmas and HAppy Holidays friend! Those look perfect, had to visit after seeing them on Insta. 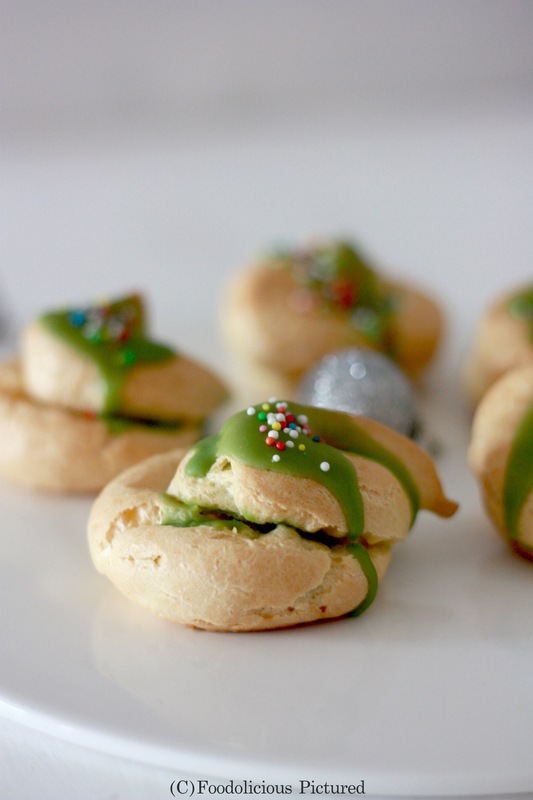 Love how magical Choux pastry is. Merry Christmas and Happy Holidays friend.